David Gelb’s remarkable documentary film “Jiro Dreams of Sushi” opens quietly with images of a peaceful restaurant, white gloves, and a man explaining the importance of falling in love with one’s work. We soon learn that the man is 85-year-old Jiro Ono, the founder and head chef of the Sukiyabashi Jiro sushi restaurant in Tokyo. The men behind the counter, including Ono and his eldest son Yoshikazu, go about their food preparation with low-key, deliberate gestures. As the film progresses, however, we learn the intricacies, and heartaches, of getting to the top of Japan’s sushi game. Filmmaker Gelb directs his camera at the sushi preparation with a food lover’s eye for fine detail. In careful close-ups, bolstered at times with slow motion, the viewer follows the fish as it moves into the restaurant, through the hands of the staff, and finally, out onto the counter, resulting in tiny plate after tiny plate of miniature inspirations. Even if you aren’t much of a sushi eater, you’ll feast your eyes on the process. When it comes to shooting the men behind the sushi, Gelb shows a similar sure-handedness. He drops his camera back a bit, usually framing a man’s head and torso with the structure of the restaurant. This reinforces the primacy of the restaurant in all their lives. Each man, from Jiro to Yoshikazu to the chefs studying under Jiro, has his own story of learning and dedication to tell. The film waits patiently as each staff member adds his part to the history. One crucial sequence places the father and one of the sons together in the same shot but sitting apart from each other, one closer to the camera. As the father laughs, remembering old and trying times for Sukiyabashi Jiro, the son unobtrusively lowers his head and sighs, with only a faint trace of his father’s mirth. Clearly, his recollection of those days is very different. Ono’s sons, Yoshikazu and Takashi, clearly worked extraordinarily hard for their father, but Ono, in fairness, never — until the onset of health problems — gave an order he wasn’t willing and able to carry out himself. The film also shows the men together in the kitchen. From what they’ve already told us on screen, we now appreciate the sacrifices they’ve made to move in concert, behind and between each other just so, in a carefully choreographed ensemble to serve up the edible perfection we’ve already seen. A restaurant critic named Masuhiro Yamamoto explains the odd circumstances of Sukiyabashi Jiro. It is tucked away in a Tokyo office building, along a public corridor leading to a train station. Its tiny serving floor features exactly 10 seats, plus three tables. 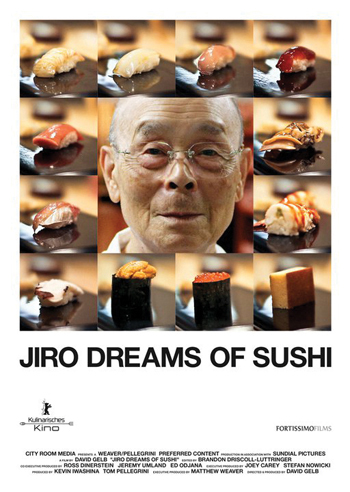 “Jiro Dreams of Sushi” opens Friday, March 30, at the Harvard Exit Theatre, 807 East Roy Street on Seattle’s Capitol Hill. For prices and showtimes, consult local listings or call 206-781-5755.